I was so excited to have attended the Sydney On Stage event at Luna Park yesterday - It's always exciting to get our first look at the amazing products coming up in the new Annual Catalogue! This event was even more special given that it's the 30th year for Stampin' Up and there were quite a few surprises! As usual, I told myself to keep my swap cards very simple ... and as usual I didn't listen to myself! Thank goodness for my trusty (and awesome!) Stamparatus! 65 Swaps for On Stage Sydney! There were 50 Crazy Crafters Team members at the event and I also wanted some to swap with others so I made 65 card fronts! Keep scrolling down to see the amazing and generous swaps that I received in return! 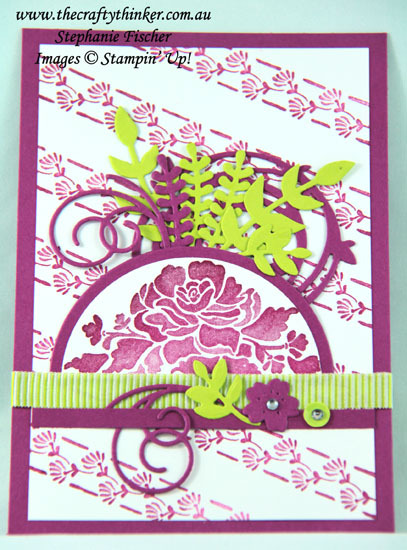 Not only did the Stamparatus allow me to stamp the background using the Hinge-Step technique and to easily stamp the flower in the correct position on the semi-circle of Whisper White card but it also saved my sanity! When making quantities of the same card it's always best to work in batches but I very quickly become bored of repetitive tasks. 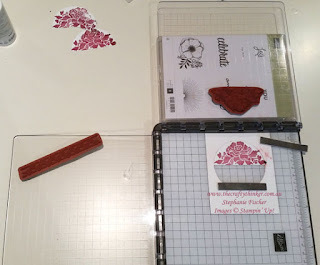 Since the Stamparatus has 4 surfaces for stamps, I could easily switch between stamping the background and the flower without having to clean or move anything. 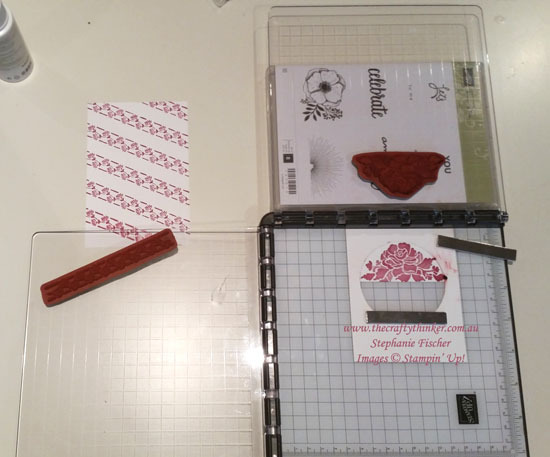 Before starting the die cutting, I cut the cardstock into appropriately sized strips. I found this helped me to save some wastage. In fact, after cutting the swirls, I even found a use for the leftovers. So we're coming up to the most exciting time of the year. We'll be saying farewell to some things (in some cases very sadly) and preparing to welcome some great new things that will excite and expand our creativity - including the amazing Stamparatus! I'll be providing some sneak peaks in the weeks to come.